Step out of the shade with the Mini Me® Automatic in Black and Red colours. 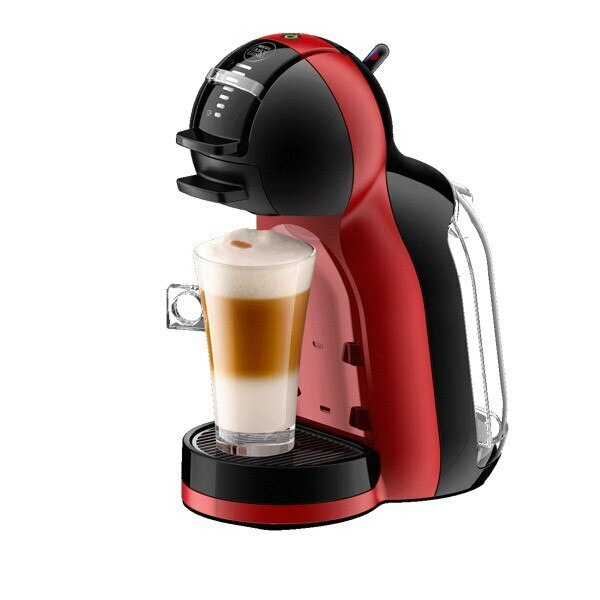 Compact but never lacking on quality, this automatic coffee machine takes the effort out of creating amazing quality coffee in no time at all. Boasting the easy-to-use Play and Select feature, simply choose the volume of your drink and let the machine do the work for you. From Preludio to exciting Cappuccino, there’s always something to suit the occasion and time of day. Its maximum 15-bar pump pressure means you get the quality you’d expect from your local coffee shop, which shows in the classic layer of crema on our classic coffees such as the Americano. This is my first Dolce Gusto machine and wow. So easy to use the pods tell you exactly the right setting and the machine does the rest. Small enough to sit on ny desk makes upto 3 drinks so only needs filling twice a day. Well that unless the 17 year old get his mits on it. Originally bought for coffee but the Chia tea latte is by far the drink you can use. Still to try cold drinks but not high on my list. This is my third Dolce Gusto machine. The first two were the original, big design. One was for home and the other for work. They are both still going strong. This one was obtained after 12 months subscription to 6 packs of coffee per month. We love it. Firstly, it is smaller and takes up far less space in the kitchen and the black and red colour fits perfectly with our colour scheme. Being smaller, the water container is smaller, but that is not a problem, still big enough for all our needs. I love the automatic function. It means you do not have to hover over it, watching to avoid overflowing cups. You can also get a more consistent strength of coffee and, you know what, if you want to add a bit extra water, it's easy to flick the switch and add a little more, so no loss of control. Coming from the original, I think this is a real step up and we are very pleased. We are now passing our old machine on to a recent convert, so nothing wasted.